In the words of Derek Zoolander, 200 South is “so hot right now.” It’s true, 2nd South, like much of Salt Lake City, is pretty hot right now. On any given night the stretch between 1st and 2nd East along 2nd South is buzzing with activity. It’s no wonder: this extra wide, divinely inspired street contains a boutique sneaker shop, co-owned and curated by a professional snowboarder; a pizza-by-the-slice place, bringing a bit of the East Coast to the Rockies; a Lebanese restaurant that crushes it, serving delectable food and offering tableside hookah; two bars owned and operated by a famous Hollywood actor; and an influential, privately owned art gallery. The gallery, Modern West Fine Art, occupies the ground floor of the historic Stratford Building on the corner of 2nd South and 2nd East. Considering the amount of activity the adjacent businesses conjure up, it is likely that any artwork displayed through the giant, street-level windows gets a lot of attention. 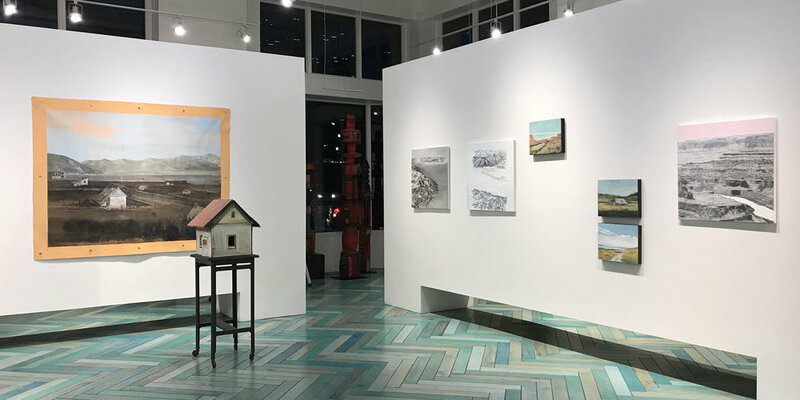 This month it’s Point of View, the work of Kiki Gaffney and Tom Judd, partners from Philadelphia whose work is inspired by explorations of the landscape of southern Utah. From a formal perspective, the artists’ works seem to share little in common. Using graphite, Kiki Gaffney deftly renders her subject matter using the precision of a mechanical pencil, her marks caressing the form the way a sculptor’s hands might mold clay. Using a keen eye for observation, Gaffney carefully models a specific natural element, such as undulating tree bark as it wraps around the cylindrical trunk of a fallen aspen or cottonwood branch. Once the expertly rendered form is complete she stops, resulting in an isolated shape surrounded by the white negative space of the substrate. Looking closely at Gaffney’s carefully rendered images, it appears that she is nudging the viewer toward a greater appreciation of natural phenomena that are often overlooked or taken for granted. Tom Judd takes a different approach to mark making. He uses oil paint to foreground expressive brushstrokes that move across the surface of the canvas, almost as if they are searching for something. 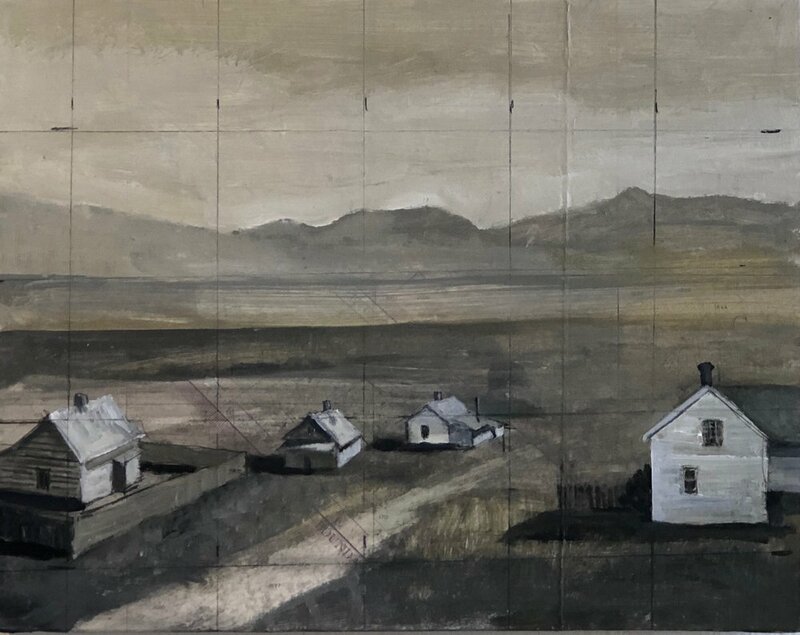 He utilizes a subdued color palette (picture the subtle grays of southern Utah in the winter), to convey a calm, slightly melancholy feeling, reminiscent of a faded memory. The results are works of varying size depicting quiet landscapes, containing evidence of human activity, such as barns and old trailers, but devoid of the intensity of the human figure. Judd also incorporates collage and some works reveal evidence of a painting surface that has been covered with scraps of old paper, or maps that peek through in areas where the oil paint has been thinly applied. Although these two artists’ approaches to mark making and their chosen mediums differ, there are subtle hints that help the viewer find harmony between them. One primary component that draws their work together is structural. It is something that brings most residents of a city together: the grid. Looking closely at both artists’ work, an underlying grid appears. At times it looks as though they have intentionally foregrounded the grid in sections of their work, such as in “The Valley” by Judd and “Lace Portal” by Gaffney. Other times it vanishes, obscured by paint or graphite. In this way it acts as a shared language, binding the work of these two artists together. In the context of a city, the grid is a fundamental tool for helping us understand our place within an environment. In the case of the work of Kiki Gaffney and Tom Judd it seems to act as both measuring device and as a metaphor for how these two artists interact with the environment of southern Utah. “Point of View,” Kiki Gaffney + Tom Judd, Modern West Fine Art, Salt Lake City, through Jan. 12. Their work also can be seen during the Gallery Stroll reception Dec. 7, 6-9 p.m., with select small works by represented artists. Born and raised in Manhattan, Josh Graham is an M.F.A. candidate at the University of Utah and now calls Salt Lake City home. Street Art Boom, Street Art Bust? Thank you for such a thoughtful, well written and insightful article. You really captured the nuances and complexities of their work, and the connections made together for the exhibition.